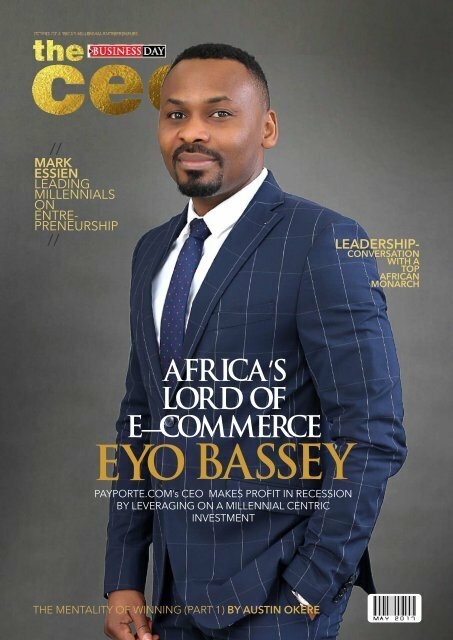 The BusinessDay CEO, May 2017 | 04 MARK’s since 2013. Hotels.Ng has carved a name for itself not only in the country but on the continent. Let us know your journey to Hotels.Ng? I started of as a software developer, looking for something I could build that would have a huge impact on the African continent. At the time, it was impossible to book hotels online, and I thought to myself - why? This exists all over the world, why don't we have it, in spite of all the hotels in the country? So I sat down and built it. And people liked it and started using it - we gained traction and were able to build a business out of the idea. You have a keen interest in startups and are known to give solicited/unsolicited advice especially on social media. Is this influenced by your experiences when you were building your business or do you have a knack for these things? I believe that startups and businesses built on technology are among the most important things we can do as humans - we push the boundaries of knowledge, while at the same time making things easier and more convenient for people. I'm very passionate about startups and see them as an important developmental tool for our country.